One of McMenamins' favorite musical traditions, the Great Northwest Music Tour has delivered the finest regional and national talent to our historic hotels for over a decade. With its early start time, family-friendly setting and no admission charge, it has become one of the best ways to catch both rising acts and longtime favorites. We've run well over a hundred of these one-of-a-kind music tours through our hotel properties... join us as we raise a toast to hundreds more to come! For nearly half a decade, The National Reserve has spent its Friday nights lighting it up at a Brooklyn bar, winning over barflies with epic sets and a remarkable breadth of songcraft and showmanship. 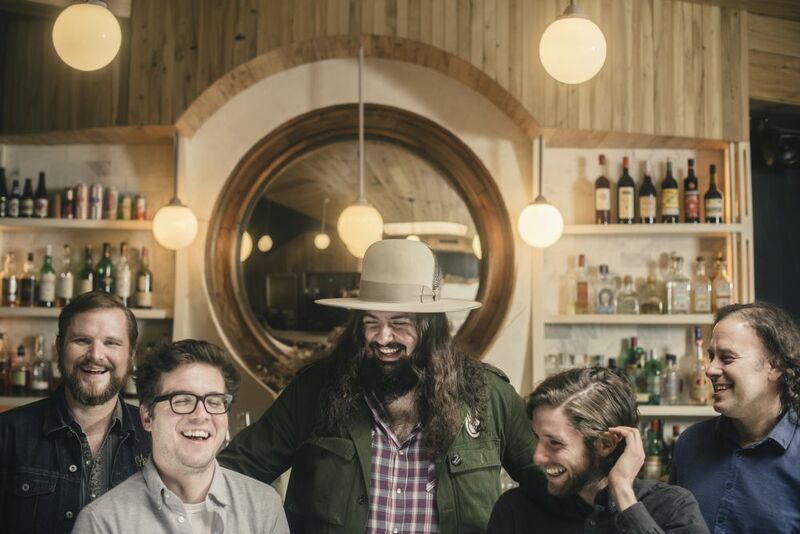 Now, with their stunning new Ramseur Records debut album, MOTEL LA GRANGE, the band has captured every bit of that energy, emotion, and entertainment for all to hear. Founded and fronted by singer-guitarist Sean Walsh, The National Reserve mine an archetypal musical seam, marrying gutbucket R&B, Laurel Canyon lyricism, New Orleans funk workouts, late night soul, and boozy rock ‘n' roll to create their own timeless brand of American music. Songs like "Found Me A Woman" and the indelible title track reveal a gifted new tunesmith while masterfully reminding one and all of the simple beauty of a great American bar band - two guitars, organ, bass and drums rocking out in the corner, singing their songs to soundtrack the night. The New Jersey-born Walsh began his musical journey amongst New Brunswick's all-ages house show punk scene, a formative experience that instilled his standing belief in the power of music to create community. New inspiration came in the form of classic American artists like The Band and Bob Dylan, whose rebellious, revolutionary spirit proved especially mind-blowing. "When I heard BLONDE ON BLONDE," he says. "I thought this is way more punk rock than anything I had ever heard." Walsh began writing songs and relocated to Brooklyn where he put together the first iteration of The National Reserve. The band worked hard, traveling constantly in an effort to both grow as artists and win over new fans. In time, Walsh eventually united the ideal National Reserve lineup he'd been working towards - guitarist Jon LaDeau, bassist Matthew Stoulil, keyboardist Steve Okonski, and drummer Brian Geltner. Having found his crack combo, Walsh took The National Reserve off the road and began taking a more "old school approach" inspired by the paths taken by some of his greatest musical heroes. "Look at The Band." Walsh says, "Guys like Taj Mahal and Leon Russell, they cut their teeth doing what we call residencies now but were just a gig back then. You'd play three weeks at one club and then move on; play three weeks at the next club. You basically holed up somewhere and learned how to entertain people. And that, in my opinion, is something that has been lost." The National Reserve settled into their new paradigm and began playing marathon weekly gigs at Brooklyn's Skinny Dennis in Williamsburg; four-hour sets that encompassed arcane R&B covers, classic rockers, and Walsh's own increasingly potent original songs. "We've missed maybe ten of ‘em," Walsh says. "Last time I did the math, we had played close to a thousand hours, just at that one bar." Week after week of hard performance strengthened The National Reserve into an unstoppable unit. Walsh's initial singer-songwriter approach merging with the band's growing muscle to create a full-bodied rock ‘n' roll that both warmed patrons' hearts just as it kept them moving on the tightly packed dance floor. "I just wanted to get good at playing music," Walsh says. "I wanted us, as a band, to really learn how to communicate and learn the language of playing music together. That was the first goal. And second, I wanted to learn how to be an entertainer. I looked at all the bands and artists that I loved, and they all understood that was their job." Walsh still appreciated that making great records was part of said gig and led The National Reserve through a number of studio visits, chipping away in Lexington, KY, Denver, CO, and Brooklyn over the past five years, recording and re-recording tracks determined to nail it down beyond doubt. "This group of songs is really important to me," he says, "so I kept coming back to it. I just wanted to be sure we got it right." MOTEL LA GRANGE truly came together in 2017, produced by Walsh at Brooklyn's Studio G with the help of longtime friend and collaborator, engineer Alexi Berthelot, and then mixed in Lexington, KY by Duane Lundy (Jim James, Ringo Starr). Despite a few prior National Reserve recordings, Walsh sees the album as his band's first. Indeed, the album spans Walsh's arc as both songwriter and bandleader, kicking off with "No More," one of his earliest songs and still among his favorites. "It's one of the first songs I wrote where I thought, I've figured it out," he says. "We were never able to record it properly though until now. I think I like my early songs better because I didn't care about anything back then, I was just writing whatever I felt like writing. As you move on, you begin to get these weird pretensions in your head, but when you are just starting out, you don't think about people actually hearing what you're writing. That's a constant struggle, really." Always determined to create a community, The National Reserve invited some of the innumerable friends they've made over the course of many, many Friday nights to join them in the studio, among them keyboardists Brian Mitchell (Levon Helm & The Midnight Ramble Band, Bob Dylan, BB King, Les Paul) and Brion Snyder, pedal steel guitarist Jonny Lam (Sinkane), percussionist Charlie Kessenich (Ensemble, et al.) and harmonicist Brian Hurd (Daddy Long Legs), with backing vocals contributed by Margo Valiante, Amanda Khiri (Sinkane), Kelli Scarr, and Alberta Cross' Petter Ericson Stakee, among others. Walsh made certain the sessions caught fire by leading the band in the studio just as if they were on stage, giving full life to tracks like the album-closing cover of "Roll On Babe" (written by Derroll Adams and then made famous by the one and only Ronnie Lane) as well as the righteous R&B burner, "Other Side of Love." "We had no intention of recording it," Walsh says of the latter, "but right at the end of the very last session, we had about twenty minutes left and someone said, what about ‘Other Side of Love'? We nailed it on the first take, just played it live, and as we listened back it really proved to me just how strong this band is." The National Reserve has now commenced their return to the road, eager to introduce audiences to MOTEL LA GRANGE, though Walsh admits traditional touring has taken some readjustment. "At first, doing a regular 30 to 45 minute set was a bit of a challenge for us," he says. "I can't really turn on that fast. It takes us a couple of hours just to really get started now. So we've come up with a routine, we'll play in the dressing room for a bit before the show starts, just to warm up." With MOTEL LA GRANGE, Walsh and The National Reserve have crafted a rich and raucous collection that instantly places them among Americana's finest - its force, directness, and performance not unlike some lost recording unearthed from the golden age of 70s rock ‘n' roll. Justifiably proud of what he's accomplished, Walsh is now planning to bring all the fun and fire of The National Reserve's fervent Friday night sets to the rest of the world, eager to pack as many folks into his band's late night scene as possible. "Music is really powerful," says Sean Walsh. "It changed my life, which is why I do it. If I can reach people with our music, maybe change their life, that would really be incredible."